Humans have been growing food for more than 10,000 years, so do we really need an app to show us how to do it? Well, probably. According to the South Burlington-based National Gardening Association, about 39 million households in the United States plant edible gardens, but 20 percent of them give up every year. That’s a whole lot of discouraged gardeners. Jim Feinson, president of Gardener’s Supply, thinks we can do better. It’s no wonder. Considering all the planting, fertilizing, mulching, weeding, pest control and harvesting, gardening is an information-heavy activity. When you know what to do, it’s fairly simple. Reaching the knowledge threshold, however, takes grit. 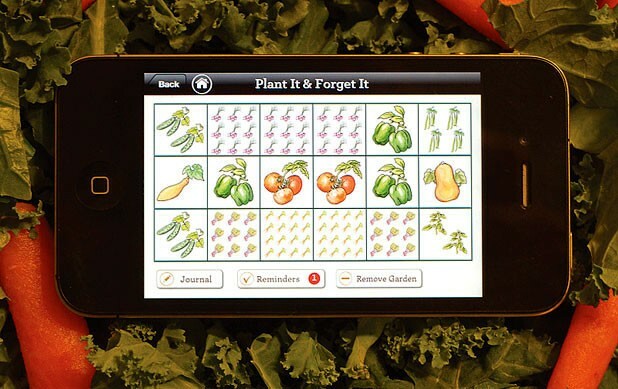 Feinson’s solution is called GardenMinder, an app for Apple devices, the Amazon Kindle Fire and the Barnes & Noble Nook that makes gardening about as uncomplicated and inviting as it can be. Following on the success of the Kitchen Garden Planner on Gardener’s Supply website, the $9.99 app lets you pick from a menu of preplanned raised-bed gardens and walks you through every step, giving how-tos and providing “push notification” reminders along the way. More advanced gardeners can design their own plots, picking from a selection of more than 70 fruits and vegetables. What sets GardenMinder apart from the other apps is primarily the know-how from Gardener’s Supply. With years of feedback from hundreds of thousands of customers, 18 test gardens around the country and experts such as Vermont’s Charlie Nardozzi on speed dial, the company is uniquely equipped to provide gardening advice on a national scale. Ross is part of the demographic most associated with gardening fervor, but that’s changing. When Nardozzi gives gardening talks around the country, he’s seeing a lot more twentysomethings in the audience than he used to. “It’s kind of like there are two generations meeting,” he says. Younger people are growing their own food for the same reasons as their forebears — they seek fresh produce and value — but also because they see the practice as a way to address the ills associated with modern agriculture, such as global warming and farmworker exploitation, he suggests.